John Edward Jones’s parents, Edward Jones & Lucy Bowen, were married in 1891 in Forden, on the borders of Shropshire & Montgomeryshire. (Volume 11b Page 359). They, like thousands of others over the years came to Deeside for the work at John Summers & Sons at Hawarden Bridge Steelworks. Their address on the 1901 census was Plough Cottages, Aston, Hawarden, (then in Cheshire). Head of the household was Edward Jones, 28, a Labourer in the Ironworks. Edward’s wife, Lucy was 29. Their listed children were Ellen 9, Harry 8, John 6, Robert 4 and George was 2. All the family had been born in Marton, Shropshire. Edward’s brother Henry was recorded in the household. He was single and also a labourer in the Ironworks. A Boarder, John Lewis, who was 18 and single also worked at the Ironworks. The 1911 census records the family still in the area of Aston, living at 1 and 2 Plough Terrace Aston Hawarden, (now in the county of Flintshire). Edward 38 was a Chemical Stone Burner. His wife of 19 years, Lucy Maria was 40. (This time her place of birth was listed as Llandyssil Motgomery). 6 children had been born to them, and all were still living. William Henry 18 was single and a Doubler, John Edward 16, was single and an Opener, Robert 14 was a Chemical Labourer, Cornelius George 12 and Margaret Elizabeth 9, were both at school. UK, Soldiers Died in the Great War, 1914-1919 accessible on www.ancestry.co.uk confirms his Regimental Information as above, but the death date is different, (4th August 1917). It tells us that he enlisted in Queensferry. His medal card, also on ancestry details his medal entitlement. 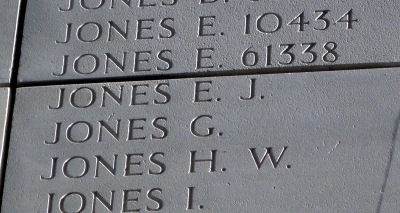 Unusually, there are two index cards for Edward John Jones in the Flintshire Roll of Honour at the County Record Office in Hawarden. (Shotton F19 and Hawarden F20). One was completed by his father Edward Jones, who dated the card as 7th January, but gave no year. The other was by his Mother, Lucy Jones who dated the card 23rd June 1920. Lucy stated that his period of Service had been 3 years, whereas Edward stated that his period of service was from March 1915 to July 1917. They both gave John Edward’s address as Ivy Cottages, Aston, Queensferry. Thanks to the Information given to me from one of his relatives, Horace Roberts, we know that John Edward was killed in the first few hours of the first day of the 3rd Battle of Ypres 31st July 1917. Many thanks to Horace Roberts for confirming the correct date. Edward John is also named on the Queensferry School Plaque in the Queensferry War Memorial Institute and on the memorial Screen in St. Ethelwold’s Church Screen. In the County Herald dated 5th October 1917 a List of Casualties was published and Edward John was among the men who were named as having been killed – Royal Welsh Fusiliers – Jones, 55998 E.J. (Queensferry). 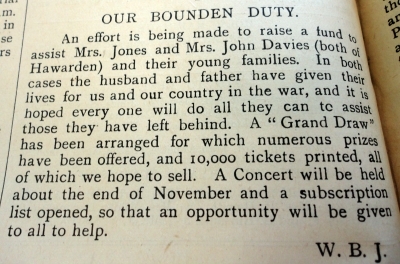 I do not know for certain that the above cutting referred to Edward John Jones, but the date is about right, so I am including it, although it may refer to a married man with a young family, but in any case it is social history of how the community were trying to deal with the loss of young men.